With fall migration well underway everywhere, it’s a good time to see what’s flying in bird news. 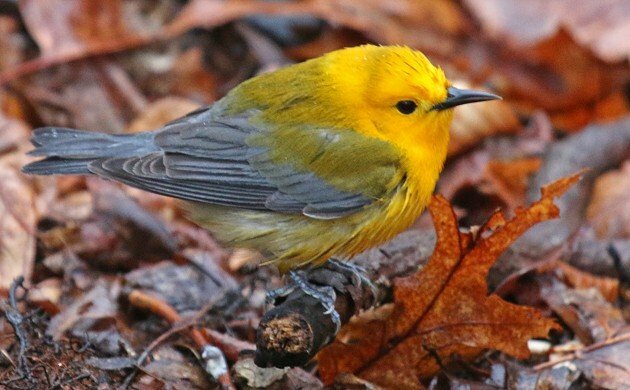 Prothonotary Warblers (like the dapper bird above captured for posterity by Corey) should carry frequent-flier cards—a recent Audubon-led study found that one geolocator-toting individual racked up more than 5,000 miles in eight months. Can California Condors be taught to avoid the dangers of power lines? Staff from the San Diego Zoo think so. North American breeders winging their way south for the winter may want to head for the Bahamas, where a new national park offers them protected habitat. Birds facing a long migration are more apt to take a gamble and stop for a bite in predator-prone habitat, according to findings in The Auk. A mummified European Kestrel gives insight into ancient Egyptians’ relationships with raptors. Don’t put off that birding trip to Ghana on your to-do list—if trends continue, illegal logging may leave you with nothing left to see. Lastly, another September 11th has passed, and with it another round of duty for NYC Audubon volunteers who help rescue birds caught in the “Tribute in Light” memorial.